What was the inspiration behind imċaqlaq? What’s your background on working with these specific media that is glass and wood? ”As an artist I work best when deploying an experimental approach following intuition, observation, and reflection. I see that most of my work informs itself, its subsequent path, its titles, its site and its domain. In this respect imċaqlaq’s emergence is no different. As my practice goes, I find myself following my work, while I try to keep myself a few stages behind it so that I can follow it better respecting the material it takes shape in and the site it unfolds in. A key work that informed imċaqlaq is listed under the same series in my website (see fig 1.) however it has more to do with the series depositum, following an installation I made with found flaked paint rested on drawing pins aligned close to the perimeter of a space. (Fig 1) the work in it was more about the process of flaked paint inhabiting an unusual space, the idea of representing flaked paint as an artwork against the intense history of painting and representing it as a painting. It was a work that was inverting the process of frame/ made to fit the work, where in that case the work was made to fit the frame. But it was a start where unaware I was giving attention to the peripheral realms of art. The work in (Fig 2) was initially intended to be also a base for it being installed and inhabited with paint flakes like the first however when I have seen the work in that stage I realized that the work was ‘finished’ and strong in its own right and about something different from what I was intending it to be. I really like it when this happens in my work practice its shows a genuine dialogue and relevant discipline between my practice, myself and contemporary art. And from then on I decided that imċaqlaq should be explored in a series of works around the frame the glass and the mirror. I tend to work with found frames and discarded objects as I see myself responding better and more directly in this manner. An underline that I try to make is that I do not consider these works as designed mainly because I have tried to carry ideas forward and more controlled on paper prior to working with a new frame and they were never as successful as when the work was responding directly to each individual frame intuitively. How is imċaqlaq integrated into Robert Callender’s poetry of the everyday in your perspective? ”Apart from the obvious fact that the curated room showcases work by emerging artists that all have been selected for the RCIRYA (Robert Callender International Residency for Young Artists), one pivotal aspect that fascinated me about Callender’s work process is the relation (if any) between the appearance of objects and the essence of objects themselves. This thought came to me when I was in Japan doing the RCIRYA and I came up with the work residuum and reflecting on stratum I was looking at contemporary art in Osaka at the time during the residency when I came across the work of Bertrand Lavier, Piano, where the artist painted directly on a pianoforte a pianoforte. This aspect has started to resonate with Callender’s Plastic Beach mainly and my own work stratum where I was making paintings of water and afterwards destroying them by water itself to heighten this metaphysical relationship between essence and appearance in objects. Imċaqlaq, departs from the found, and discarded object (all my frames and glass are made from unwanted materials by others) Not one of the works will be pre designed and made in that order. The word imċaqlaq itself came to me when I was thinking a title for the work in (fig 2) and for me it looked like a section of choppy sea, the maltese word imċaqlaq can refer to this unsettled aspect of being choppy but it also can means something that is moving, or being made to move. I suppose as the artist I am ‘touching’ and ‘disturbing’ these existing objects. More than poetic I find these works quite anthropomorphic in the sense that like humans they fight their corner for attention the frame that becomes the artwork, the glass that shows its side and doesn’t glaze anything else to be shown through it. 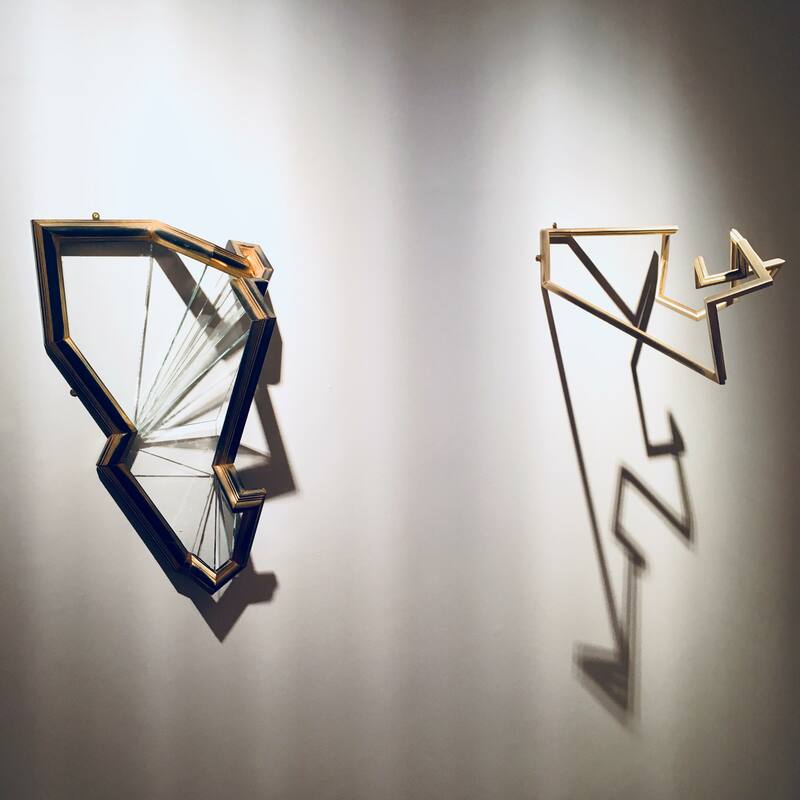 How would you comment on the metaphysical quality of your three dimensional artwork and the way it reflects on the viewers’ psyche and art perception? ”This is a difficult question, which I feel I already started to answer in the previous paragraphs. Usually I do not tend to keep the viewer in mind when I make art. I make it because it has to be made in some kind of weird artistic nuance. I do not like to write deeply about my work to make it sound deeper than it actually is. I make artwork and then I try to describe it best I can with the experiences and interests and observations that I am able to make. I try to convey meaning very intricately using precise words, however never I try to explain my work or try to convey its meaning. As one can see from the way I write about my work on the web, I sometimes merely describe the process or give a direction or indication about pivotal aspects the work is engaging with. The metaphysical aspect comes through my cultural background and my experience/ interest in spirituality and philosophy, and those are aspects with how I live not just make art. Regarding the art perception, I am very interested to engage with whatever is out there in the realm of contemporary art and maybe here I use the term contemporary loosely, as I can make references to older artworks but the act of bringing them in dialogue is a contemporary act in itself. The exhibition is on until 8 July 2018.